WILKES BARRE, PA--(Marketwire - April 30, 2008) - Impecca™ (www.impeccausa.com), a leader in the portable Audio Video Products arena, suggests you skip the flowers and get mom a gift that keeps her up to date on all family activities through digital pictures. She doesn't even need a PC, just an internet connection. The gift giver can control the photo content at another location. Impecca's Wi-Fi LCD digital picture frame will allow her to view unlimited pictures, movies, music and more via the internet and search engines including Yahoo!® and Google™ Picasa -- all without a computer. Competitively priced to other standard non-Wi-Fi digital picture frames on the market at $349, Impecca's 10.4" Wi-Fi frame delivers a high-quality picture (800x600 resolution) and superior performance. These new frames can play slideshows of the user's favorite pictures and videos set to music and offer versatile features that can be managed via remote control. The USB 2.0 equipped frame also connects to one or more computers directly, allowing users to access and receive unlimited music, movies, photos and more. directly through the Wi-Fi frame without using a computer. computer means unlimited computer power. --  Photographers can demo their photos to clients remotely at any time. the class any time anywhere, wirelessly. 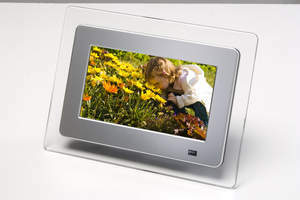 Impecca's Wi-Fi LCD digital picture frames can connect to a single computer at a time or via the internet. Similar competitive picture frames do not offer the same internet versatility and functionality that the Impecca Wi-Fi frames offer. Images, video and audio clips available for download are included in the following formats: JPEG, AVI, DIVX, MPEG - 1, 2, 4, and MP3/WMA. The Wi-Fi frame has an internal memory 32M and is expandable to 2GB and supports compatible memory cards featuring CF/SD/Memory Stick/XD. Impecca has additional LCD Wi-Fi frames in the following sizes: 3.5", 8.4", and 15". Weighing only 2.2Kg, the frame is very portable and comes with a 100-240V AC (input; 12v 1.5A DC output) power adapter and a 26 key remote control. Impecca's Wi-Fi LCD digital picture frames carry an MSRP of $349 and are currently available. In addition to digital picture frames, Impecca offers High-quality Portable DVD Players, a variety of stylish MP3 and iPod® Accessories and colorful Digital Media Players. For more information please visit www.Impeccausa.com. At Impecca™, we are determined in our mission to be a leader in bringing consumers the most innovative and useful yet affordable products for everyday life. Impecca™ is a leader in design, development, manufacturing and marketing in portable Audio Video Products. Impecca was founded to provide the consumer electronics market place with reliable products that are "Simply Impeccable," and is continuously growing and becoming a diversified brand. Impecca™ currently offers a spectrum of portable Audio and Video products including: PDA Portable Audio systems, PDA chargers and docking stations, USB Drive, MP3 Player speakers, Speakers for SD/Multimedia Cards, Portable DVD Players, Digital picture frames and more. Impecca™ products are recognized by users worldwide as we continue to lead the industry based on our commitment to innovation and quality. Impecca's strength lies in its ability to identify, develop and utilize leading edge technology and turn them into innovative, unique and affordable products making us the undisputed leader in every category we embark. At Impecca™, we are committed to serve electronic consumers worldwide with lifestyle enhancing electronic gadgets, and exciting digital products while securing competitiveness in the market.